When I hear the words 'retro makeup' I immediately think of Halloween, dress up parties... and hipsters. Marilyn Monroe-inspired makeup does not necessarily have to look like the Halloween Marilyn, stumbling down the alley at 3am with a broken heel. 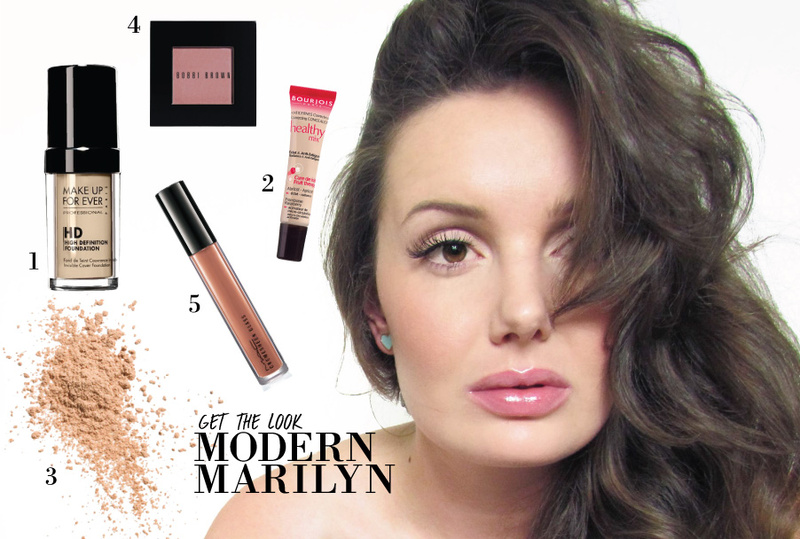 To make 'The Marilyn Makeup Look' more wearable, tone it down, go natural! Emphasize the lashes and crease of the eye, leaving out dramatic contouring and bold lips. M.A.C. COSMETICS PAINT POT - PAINTERLY. BOBBI BROWN LONG-WEAR GEL EYELINER - BLACK INK. Line the lash-line with a thin line not extending it into the traditional flick. LANCOME MASCARA - HYPNOSE DOLL LASH. Apply mascara to the top lashes only. M.A.C. COSMETICS EYESHADOW - BRUN. With a light hand, contour the crease of the eye with a small dome brush. I used the same colour to define my eyebrows. EYLURE STRIP FALSE LASHES - #117. Using duo eyelash glue, apply the false lashes. MAKEUP FOREVER HD FOUNDATION - N115. Apply foundation blending from the center of the face outwards. BOURJOIS HEALTHY MIX CONCEALER - #52. Conceal lightly under the eyes if needed. THE MAKEUP STUDIO LOOSE POWDER - 01. Lightly dust powder in the center of the face. (T-zone). BOBBI BROWN BLUSH - DESERT ROSE. Apply a light dusting of blush to the apple of the cheeks for a natural flush. M.A.C. COSMETICS CREMESHEEN GLASS - FASHION WHIM. Finish the look off with lip gloss. Et Voila!